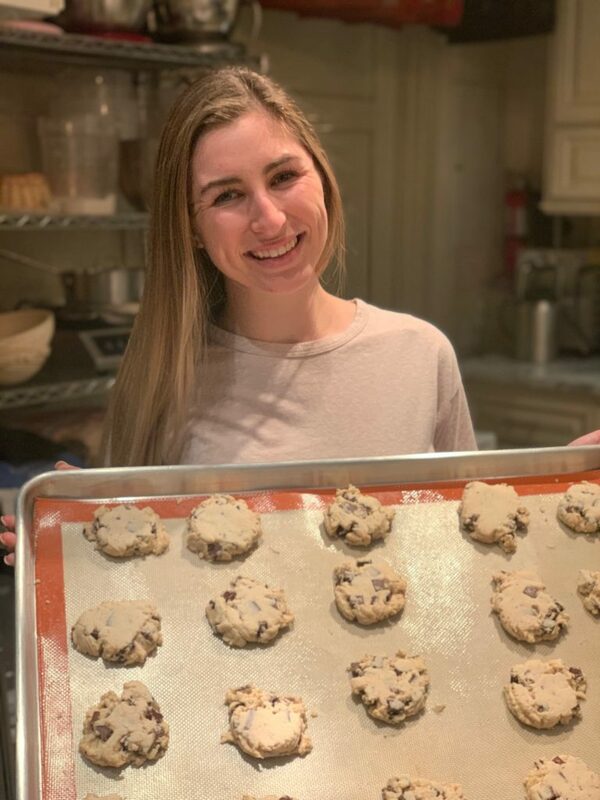 Once Sofia’s family “got started baking,” they could not quit doing what is the favorite reason people bake: To bake something special with our own hands for someone we love. Directions: Tie back hair, gather ingredients, wash counters and hands. Cream the butter and sugar for about 3 minutes until it is a fluffy consistency. In a separate bowl, combine the cornstarch and flour. Scoop the flour mixture into the mixing bowl and mix just until combined. Break up or cut the chocolate bars into chunks (quarter inch squares). Add chocolate to the mixing bowl and mix until fully incorporated. Use a 2 Tablespoon measuring spoon or a mini ice cream scoop and fill it with cookie dough. 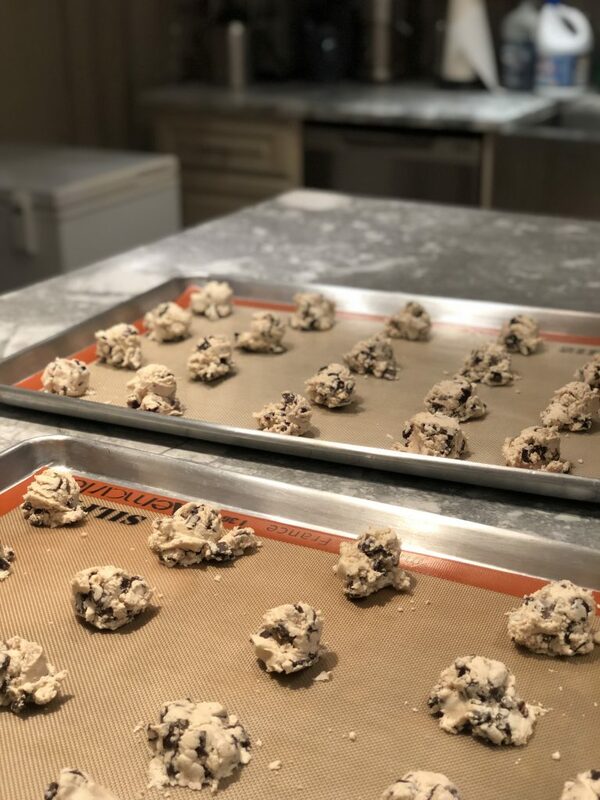 Scoop the dough onto the parchment-paper-lined baking pan spacing the cookie dough balls 1-inch apart. Take another piece of parchment paper and lay it over the balls of cookie dough. Use another cookie sheet and place it over the parchment covered cookie dough and squish it down evenly. 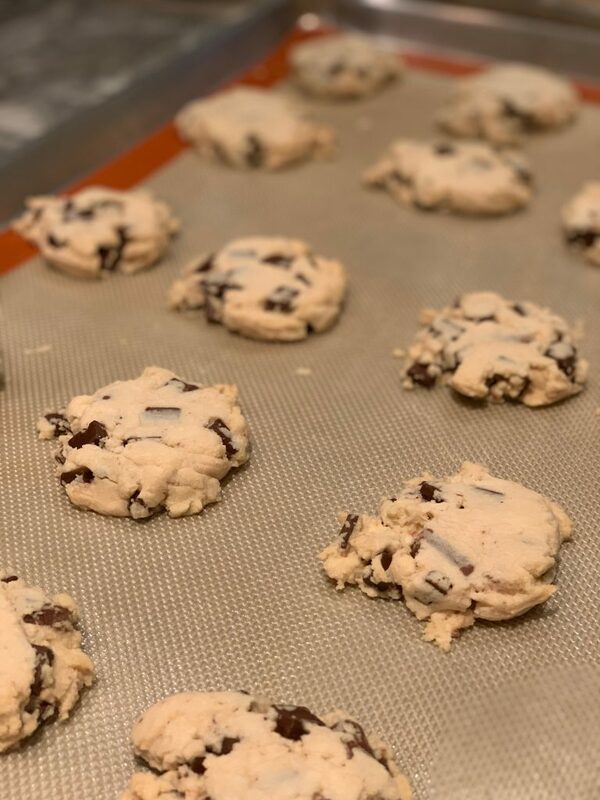 Place cookies in the oven and bake for approximately 18 minutes, baking until the shortbread cookies are lightly browned. While cookies bake, wash counter, cleaning up raw flour, batter or egg; wash dishes and hands. Remove the cookies from the pan to wire cooling racks to cool. When fully cooled, wash hands and package cookies to gift or store in a sealed food container. If you love shortbread, you’ll love baking the Southern favorites, Pecan Sandies or Russian Tea Cookies.